We know for some time that Google started hiding much of their organic search data from monitoring applications. When we come to see the keywords that originated the searches we see “not provided” most of the time. There is nothing new here, but lately it has become so extreme that Google Analytics information regarding organic search is completely useless. As you can see, 99% of our searches are not provided. 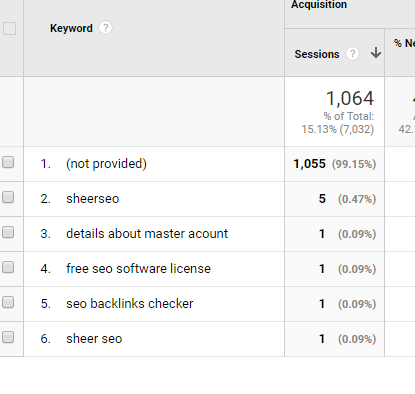 Thus, I strongly suggest on not using Google Analytics integration in sheerseo. If you can, choose the Google search console (formerly Google Webmaster Tools) instead.